This photo, taken around 1915, shows what the terrain around the Sunset Strip looked like before it was developed. It shows ranchland owned by E.A. Melrose in what was then called the Cahuenga Valley, which today is southeast Hollywood. 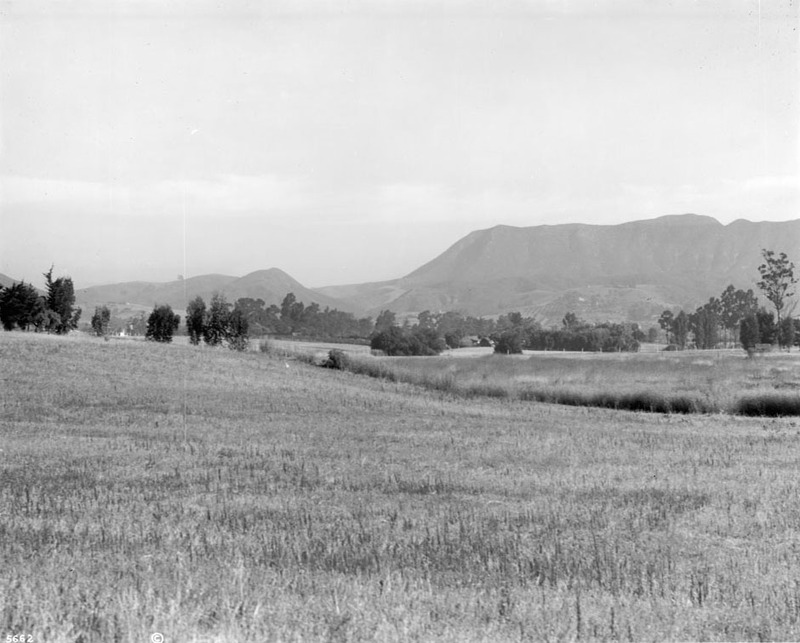 The view looks north toward what were known then as the Cahuenga Mountains but are now called the Hollywood Hills. That mountain to the right is Mt. Lee, home today of the Hollywood sign. In the 19th century, locals referred to the gently sloping plain along the southern foot of the Cahuenga Mountains as the Caheunga Valley. They probably stopped referring to it as a “valley” in the 20th century because, well, it isn’t a valley, which by definition is a geographic region between two mountain ranges. There is no mountain range south of the Cahuengas/Hollywood Hills — the gentle slope continues its tilt to the southwest toward the ocean. That large sloping plain is now called the Los Angeles Basin. The footprint of the Melrose ranch today is Western Blvd. to the east, Wilton Blvd. to the west, Melrose Blvd. to the north and Santa Monica Blvd. to the south. And, yes, it’s where the tony Hollywood street Melrose Blvd. got its name.